The Queen is to visit Google's London offices next month. The Queen has developed a growing interest in computers since meeting Bill Gates in 2005 and according to the Telegraph the Queen now has a mobile phone, emails people, sends SMS and has an iPod. After seeing the success of the Royal Channel on YouTube the Queen requested a meeting with the people behind it and will meet the developers at Google's London offices in October. 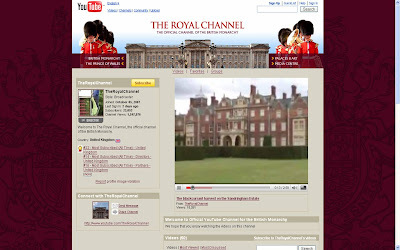 The Royal Channel on YouTube was the first monarch's YouTube channel and the Queen used it to broadcast her Christmas message in 2007 - the 50th anniversary of the first Christmas message that she broadcasted (which is also on the channel.) Videos from the Royal Channel have been watched by a large audience and the Royal Channel is currently the #22 most subscribed to YouTube channel in the UK with over 1.5 million channel views to date. I'd love to know what the Queen thinks of Google after her visit - I wonder if they'll present the Content Network or try to explain how Quality Score works? The Queen is visiting Google's London offices today and Google have changed the google.co.uk home page logo to mark the occassion!